BANGKOK – It seems like every country in Asia has their own version of a hot pot, that communal dining experience where a pot of simmering soup is used to cook fresh pieces of meat, seafood and vegetables which are in turned dipped in different kinds of sauces before being consumed. At the more refined end of the spectrum, there’s Japan’s shabu shabu, with it’s thinly sliced marbled meats dipped in the boiling liquid for mere seconds to maintain its flavor and tenderness. While on the other end you might find Taiwan’s duck blood-infused hot pot or China’s super spicy Sichuan version in which gamey mutton is the meat of choice. And then there is the very tasty Thai-style hot pot, which falls somewhere in between. The Thai version is probably known less for it’s for refinement, and more for its extensive range of hot pot add-ins, and an emphasis on seafood. And unlike other versions where the spice is in the soup, the Thai version saves the spicy for its dipping sauces, which are super flavorful. 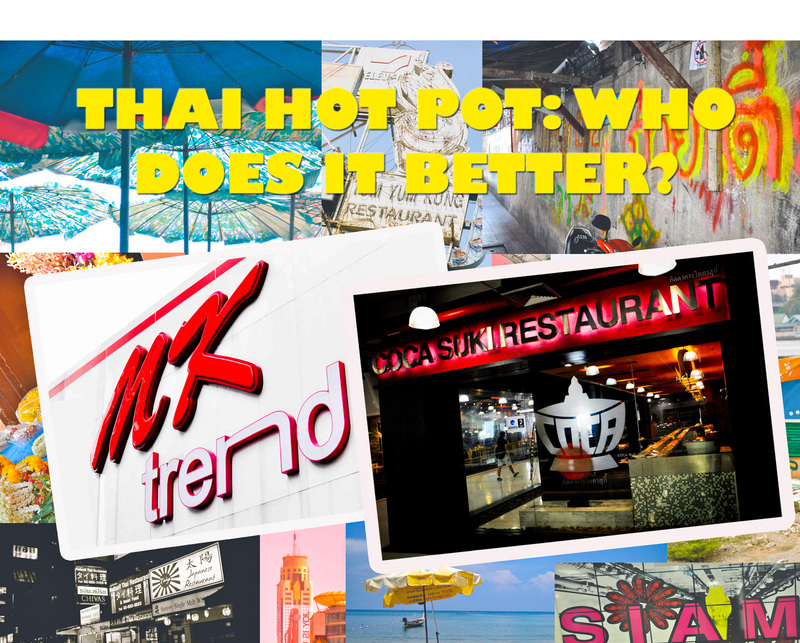 The interesting thing about the Thai version is that, among locals, there seems to be two opposing camps or restaurant chains that specialize in serving hot pot concoctions – COCA and MK. Some (like myself) prefer the hot pot served by the COCA restaurants while others (including many of my Thai friends) favor the MK chain. COCA claims its ingredients are better quality, its portions are larger, its sauces are tastier and its prices are lower and – in the end – that it’s Thai hot pot is the best. Naturally, MK makes the same claims about itself. To me, COCA restaurants tend to be a bit more upscale with less of those screaming kids that MK seems to attract, and ingredients seem to be fresher as well. However, my Thai friends claim it’s really about the dipping sauce, which they say is where MK really excels and sets them apart (and especially above COCA). Anyway, you be the judge. Branches of both of these Thai hot pot restaurants can be found in the Bangkok’s Siam Center, though MK seems to be almost everywhere in Thailand. (Tip: for a more rich and flavorful Thai hot pot, try adding some marinated minced fish and a raw egg or two).